Romans 13:1: Everyone must submit himself to the governing authorities, for there is no authority except that which God has established. 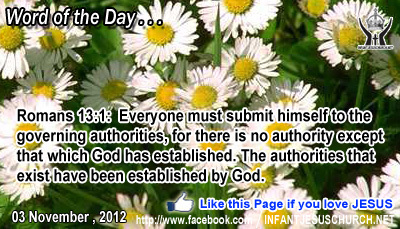 The authorities that exist have been established by God. Heavenly Father, God of the Exodus, as you have shown your power and release in the past, we ask that you act today and bless every believer who is mistreated for your sake. Please bless them with gentleness, healing, and protection on this day. In the powerful name of Infant Jesus we ask this. Amen..
Humbleness is the queen or foundation of all the other virtues since it enables us to view and judge ourselves properly, the way God sees us. Humbleness leads to true self-knowledge, sincerity, realism, strength, and devotion to give ourselves to something better than ourselves. Humbleness frees us to love and serve others selflessly, for their sake, before our personal. Paul the Apostles, gives us the most example and replica of humility in the person of Jesus, who emptied himself, taking the form of a servant, ...who humbled himself and became dutiful unto death, even death on a cross. The Lord Jesus gives grace to those who seek him respectfully. Do we want to be a servant as Jesus served? Loving Infant Jesus, you became a servant for our sake to set me free from the oppression of sin, egotism, and conceit. Help us to be humble as you are humble and to love freely and courteously all whom you call us to serve.